The Compabloc Heat Exchanger is a welded plate heat exchanger with no gaskets between the plates. The plates are welded alternatively to form channels. Ideal for chemically aggressive environments and high temperatures. Models: CP15,CP20, CP30, CP40, CP50, CP75 and CP120 with heat transfer areas ranging from 0.7 to 840m2 (7 to 8985 ft2) per unit. Compabloc consists of a stack of corrugated heat transfer plates in stainless steel or exotic materials, welded alternately to form channels. The laser-welded range of Compabloc is available with three plate patterns – the K series, designed for efficient mechanical cleaning, the L series for high-pressure applications, and the X pattern combining high pressure and mechanical cleaning ability. The two media flow in alternately welded channels between the corrugated plates. The Compabloc frame consists of four corner girders, top and bottom heads and four side panels with nozzle connections. These components are bolted together and can be quickly taken apart for inspection, service or cleaning. 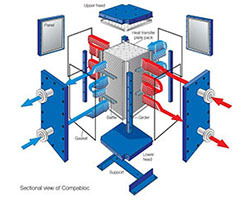 Alfa Laval Spiral Heat Exchangers are essentially self cleaning and versatile in design. Spirals come in fixed-size and customized product ranges to meet the needs of our customers. We make fixed sized small units for general use, and for application-specific uses such as the wastewater industry. The majority of spiral heat exchangers are individually customized to customers specific needs. Unique shape has unique properties. 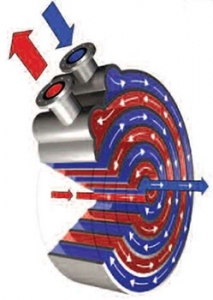 A spiral heat exchanger has two spiral channels that are concentric, one for each fluid. The curved channels provide great heat transfer and flow conditions for a wide variety of fluids. The overall size of the unit is kept to a minimum. Installation space is optimized because of efficient size of unit.